Pam Collins, an artist from Staples, Minnesota, works primarily in two divergent media: fabric/fibers and mosaics. Inspired by nature, Pam creates art that gives each piece an exclusive beauty and vibrancy. Pam’s mosaic work is rich in texture and color often utilizing recycled items such as broken dishes, recycled tiles, and other tesserae. Pam has created a wide variety of mosaic art including landscapes, florals, and interpretive subjects. She also mosaics practical items such as table tops, backsplashes, and furniture. Fabric Painting is a special technique Pam has created over time. Her process uses old discarded clothing, draperies, linens, and other workable fibers. The fabrics are cut or torn, arranged, and glued to a stretched canvas (also made from old curtains or draperies) to create landscapes and waterscapes. The manipulation of the materials brings a 3-D texture and movement to the overall composition. "The process itself is quite simple; however, looking at fabric as paint takes some creativity. How do you take a soft, supple textile and make it look like a mountain cliff or ocean? Or even clouds? This art form is limited only by our imagination." Described as "tactile impressionism," Pam challenges traditional art methods by building new techniques with textiles and recycled materials. Her use of color and texture create a vibrancy within each piece. Everyone can be creative. This is the cornerstone for Pam's welcoming teaching style. As a former student stated, "[Pam's] warm personality oozes vibrancy and is so contagious that it's easy to dive into the work." Be in the know and join in the fun. Follow along with Pam's creative journey as she unveils her latest artwork, discusses her creative inspiration, explains new techniques, and shares her artistic journey. 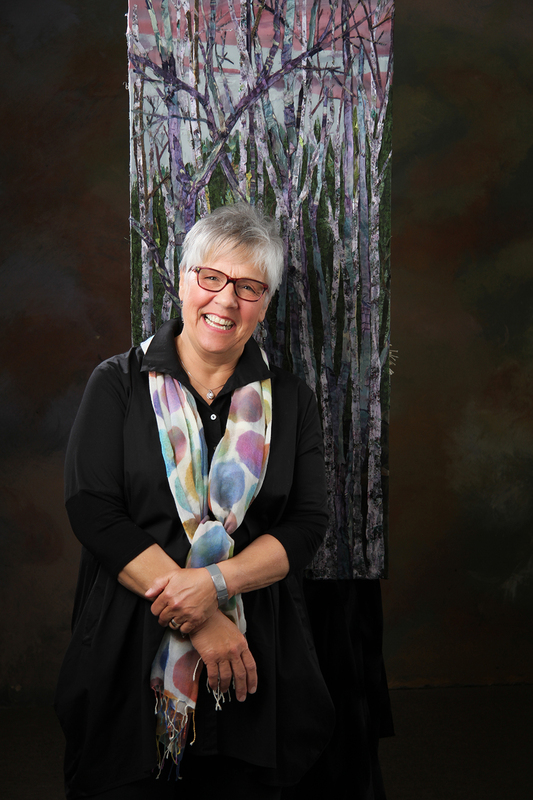 Pam was recently honored as the Textile Center's featured artist of the week. Read her interview below! How did you get involved in teaching in the fiber arts?" I have always liked the feel of fabric, textures, patterns, and designs. It has always captured my interest. As I discovered a way to incorporate my love of fabric and my desire to be an artist, I wanted to share my passion with others. I started teaching Fabric is Paint several years ago." Can you share a meaningful experience from a class at Textile Center that has affirmed your desire to teach? "A student had brought in some of her own materials to work with. They were small circular textural shapes, that were very different. We studied and experimented with them in the process and she succeeded. She was so satisfied and I was ecstatic! It was gratifying." What does your own studio practice look like? "Most days, I am in the studio for a minimum of 2 hours, either working on a piece or searching through fabric exploring for new work. I do work in 2 mediums, so I am constantly moving from one to the other. Once I get started working it is easy for me to stay there for hours on end. I always listen to music to keep my thoughts and emotions fresh." What do you do to find and develop new material that can be used in the classroom? "I am constantly looking at things; articles, images, fabric, and other art to consider as concepts to share with students. I am in constant search for that "next" experiment to bring to the classroom and share what is possible in this medium." Click here to learn more about Pam! Join in and be inspired.